Can We Trust Our Defense Capabilities? This is a translation of Tommi Kangasmaa‘s blog post “Voiko puolustuskykyymme luottaa” posted on July 16, 2015. Tommi Kangasmaa has a decree in political science and he is a Lieutenant (SG.) working at the Defence Command Finland. A recent poll says that a half of the people in Finland doesn’t trust in our ability to defend our territory. Furthermore, ten percent of those who are of this opinion think the defense capability is out right poor. If this is true, something has failed in the communication of our defense capabilities to the public. Finland, as a matter of fact, is a very difficult country to enter into by force. 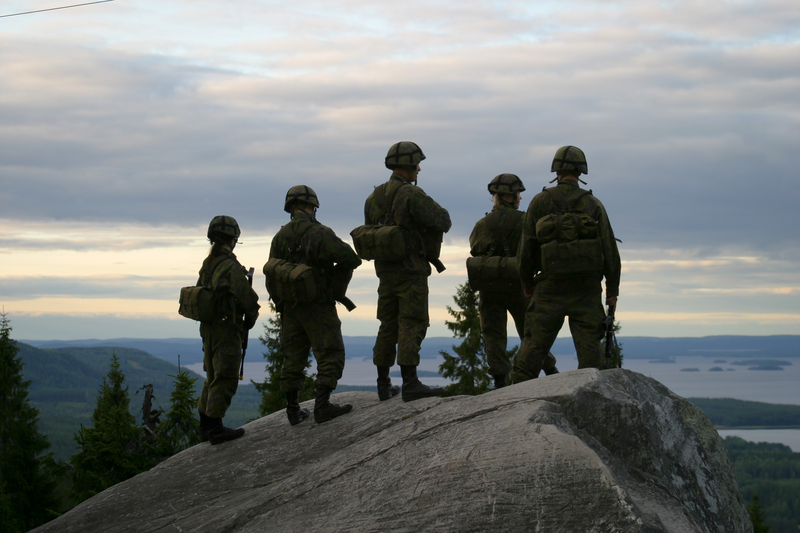 Recruits on Koli in June 2008. Picture taken by Maavoimat/Marko Jalkanen. Photo Finnish Defence Forces. Finland’s defense has several strengths. The most important strength is our people’s will to defend themselves and their country. Without this, no amount of technology or materiel is ever going to be enough. Another strength is skill. Finnish recruits have demonstrated their high skill level time after time in exercises and international operations. This skill has been show in NATO evacuations, in Lebanon, and in exercises in Rovajärvi. Finnish military personnel has both excellent training and motivation. A Finnish soldier is someone you can count on. The third strength of our defense is the terrain. No attacker can drive nor walk into our country without having to pass again and again through narrow waypoints, swamps, roughs and lakes that are easily defended by limited troops. The movement will slow down and casualties will increase. The battle moral of the attacker has to be very high to withstand the difficulties posed by the terrain, climate and the defenders. Finland’s shoreline is riddled with hidden rocks, shallows and narrow passes. A landing would be an expensive operation because the Finnish Navy’s ability to deter such an attack is greater than many realize. Air assaults can only used to control a limited area for a moment. That will not bring Finland’s moral down. Finally, there is our history. The Winter War is a real example of the Finnish ability to repel a massive attack with much weaker capabilities than we currently have. Despite that the nature of war has changed significantly, this example has the power to build faith in desperate circumstances. Why is it then that our defense capability is not trusted? The message isn’t carried from the Defence Forces to the people as it should. We are keeping the candle under the bushel. Our defense talk is primarily on funding cuts and the frequent difficulties in materiel acquisitions. We have created a spiral of negativity. Of course it is true that the Navy needs their new ships and the Air Force their fighter planes. Without them there is no defense. Our defense is based on Air Force that can contest local air superiority, Navy that can fight in our native sea environment, and Army that can operate by using the terrain and drawing on the support of the Air Force. The Army needs a significant amount of ammunition that fighting can be maintained in defense of the whole country for as long as it takes. The concerns over materiel make us scared to talk about our strengths because we are afraid that this will further increase pressures on the diminishing funding. Are we afraid that our politicians and civilians will ask: If the defense capabilities are so great, why do we need new equipment? Have we not been able to convey clearly enough that the new equipment are replacing the old and the worn-out? They are a vital part of the whole. Have we not been able to relate our way of combat and defense so that the public understands what the new materiel is needed for? And how the system of defense is build into a functional whole that relies on our significant strengths? Have we not shared how the purchases are carefully measured based on lots of data and planning? We keep the very thing secret that is fundamental to public trust. The Defence Forces doesn’t only believe in our defense capabilities but relies on it completely. That confidence is not based on hopes but on hard work, thorough planning, continuous exercising and high quality in all facets of our defense. We haven’t been able to clarify how the actual warfare is not a game where the newest stealth fighters or tanks mean an automatic victory. We haven’t shared in detail how much it takes to build enough force to beat our defenses. And how we will keep striking tirelessly in every part of the enemy’s operations: logistics, command, movement, and moral, and how we will wear them down until they are brought to a stop. We haven’t been clear that the number of troops may not mean so much on our narrow roads and in the woods. We haven’t been clear enough how advanced is our fighter jet combat system is with its capabilities and training. And how we are prepared to successfully defend our airspace against forces that may outnumber ours. We haven’t been clear how the Navy with its mines, missiles and watercraft and coastal forces can defend us against seaborne operations and how it allows continuous operation of our logistics, maintenance and supply. Exercises using the roadside bases are part of the preparedness of the Air Force for crisis situations. Baana exercise using a new roadside base in Jokioinen 2009. 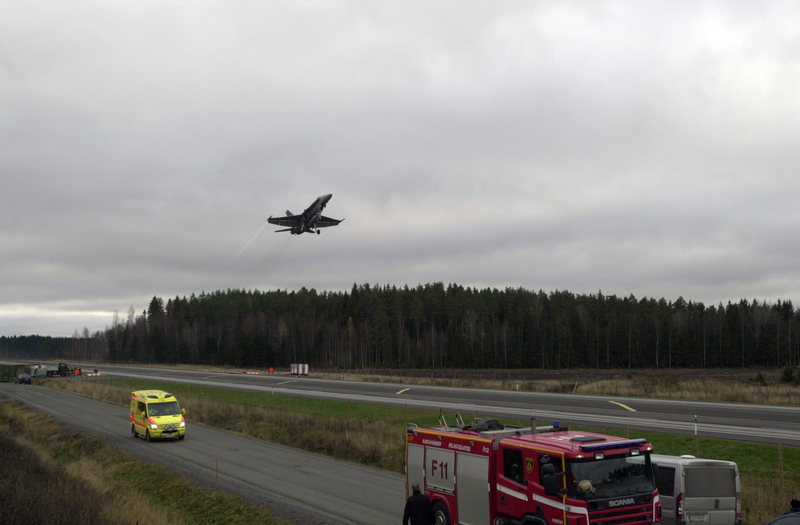 Photo the Finnish Air Force. I, for one, think that it is time to take a new look at how we communicate the message of believable defense. Looking from the inside we can see it in a different light. We must be more frank about the deficiencies and bring up also the strengths with honesty. It is hard to be believable when asking for more allotments when we can’t say simply what it will bring to the defense and what capabilities may be lost otherwise. So far, we have been able to provide a realistic capability to defend the people of Finland. Defense for the Finnish people means that we are able put an unreasonably high price for the attacker to bring this country into submission. For now, we must carry the weight of the defense alone. Should we come to the point where we can’t afford to maintain the high level of defense capability and it starts to disintegrate slowly for lack of resources, we have to be able to be frank about it. Finns must be able to expect honesty also when we have to say that if we stay alone, we can’t no longer create high enough threshold for the use of military force against us. You can never lie about your defense capabilities to your own people. Our talk must be true and the defense must be build against the threats that come because of our place in the world. While a communication problem might exist, as the blog suggests, our domestic opinions are relevant only to us (morale, funding etc). IMHO, a serious talk about believable defense turns into a ridiculous propaganda if it misses discussion of beliefs of a potential enemy: his objectives and willingness to pay the price needed for achieving those objectives. The blog mentions these only in passing and fails to discuss them in any meaningful way. What’s even more disturbing in our domestic discussion, is the ease we push aside the question of the price we ourselves are willing to pay. It seems people think there is no upper limit. That we defend this country at all and any costs. But is it really so? Are we prepared to fight under nuclear threat? And if we are, will our thinking change after Helsinki, Tampere and Turku have been nuked? And for those who don’t “believe in” nuclear threat, give a bit more careful look into the recent deeds and current doctrines of our eastern neighbor and think again. While our defense may be quite capable against conventional threats, there are some questions I’d wish to have an expert answer. Suppose a +100k exercise on the other side of border turns into an attack in a matters of hours. Are we fast enough in responding to that? We don’t have missile defense capability, how serious a problem this is for us? Our primary supply routes (maritime) can be cut beyond our reach (Gotland for example), how is that not a problem? Can enemy deny our assumed local air superiority with his S-300 and S-400 systems? I could go on and on, but I guess this is enough for now. I’d really appreciate any expert answer. (well, you can keep the “shut up and get lost” answers to yourselves). emk, thanks for your comment and thought-provoking questions. Not being a military expert take my thoughts as just that. I think we need to calculate in also the political price of starting a military invasion or using nuclear weapons against a peaceful neighbor. I do think those international costs even for Russia would be nothing but catastrophic. Although, I think it is possible to perceive a future where the political cost would become negligible. In all cases we must continue to evaluate all the costs to any potential enemy. I think turning a massive drill to an attack may seem a matter of hours, but strategic placements and gathering of other resources (for a campaign deep into other country’s territory) would have taken maybe months to accomplish. Any such activity we should be well aware of (and I think appropriate countermeasures would be long underway by then). About the nuclear option. Yes, I was thinking about a larger scale conflict between Russia and the west (NATO). One can presume Russians would perceive such a conflict to be an existential threat to them, which, according to their new doctrine, would justify use of nuclear weapons. And if we believe Putin’s statements regarding to Crimea, use of nuclear weapons is not just a last resort for them anymore. Anyway, In such a situation, Finland (and in fact, the whole Nordic region) would be a northern flank of Russian defense. I would assume they’d push their defenses forward into the Finland (at least), and have little patience should achieving their objectives here take too much time. At that point, threat or actual use of tactical nuke could present itself as an option to speed things up. This is hardly the only scenario, and maybe not even the most plausible one. Its just something I, as a non-professional, have been pondering about. About a surprise attack. You think they would not be able to conceal the preparations as something that is part of the normal, announced drill? Okay. I am not fully convinced, but its because I just don’t know enough about it. If you can elaborate, i’d be very interested to hear how your thinking goes.